Note 1: If the stricken diver does not have complete relief from symptoms after 10 minutes at 18m the treatment must be changed to the Royal Navy Table 62. 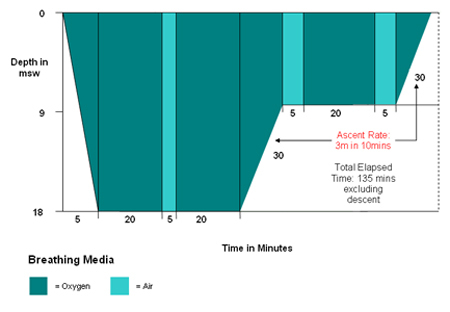 Note 2: In practical terms, a stricken diver is unlikely to recover completely within 10 minutes unless the diver has been recompressed very quickly after the offending dive (as may be the case if a hyperbaric chamber is on board or very close). This means that the vast majority of divers with symptoms of decompression sickness (DCS) will either be switched to or will have been prescribed the Royal Navy Table 62. 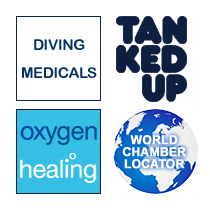 The most common treatment for divers with decompression sickness (DCS). Also used for elective therapy sessions for non diving-related injuries.